As a "twenty-first century white girl from New York," what does Lina Sparrow, a first year litigator at New York's most prominent law firm, know about slavery? By her own admission, slavery and its legacy never crossed her mind. When a reparations case lands on her desk, she wonders why she doesn't know the names of the faceless and forgotten individuals that built America, why there's no monument to them and what they wished for, worked for and loved. Even though her law firm really does not have an appetite for taking on reparations for descendants of slaves, a wealthy client does. To appease him, the firm brings in Lina and Garrison, an African-American second year associate, to do the research and find the perfect plaintiff. In this case, they would prefer a plaintiff that can show indisputable evidence proof of familial ties to a slave. And this is where it gets good. 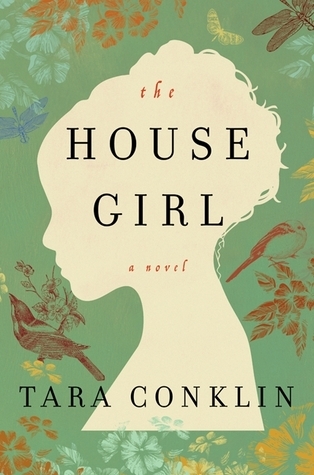 The House Girl shifts between present-day New York and 1850s Virginia, between Lina and Josephine. As a slave at Bell Creek, Josephine serves as the house girl for the Bells, Missus Lu in particular. Prone to dizzy spells and forgetfulness, Lu fancies herself an artist, but Josephine is the real artist. Raised, as it were, in the Bells' home, she has been Lu's faithful servant and confidante from an early age. As Lu has learned how to draw, so too has Josephine. But Josephine is a much better artist, and while Lu's works focus on scenic landscapes, Josephine draws the children and adults of the plantation, capturing their faces as no one else can. Josephine knows no other life than that of the plantation, but she knows there's something better and longs to escape north to a better life. In present-day New York, Lina is still searching for the perfect plaintiff when a conversation with her father leads her to an exhibit of Lu Anne Bell's work. It's always been rumored that Lu Anne's work was actually that of her house girl, Josephine. With help from her artist father, Oscar, and her own due diligence, Lina sets out to prove that Josephine is indeed the artist. I was much more fascinated with Josephine's story than I was with Lina's, though I can appreciate that Lina's research brought me Josephine's story. Equally as fascinating was Garrison's lack of desire to work on the reparation case, believing that the African American population in the U.S. is in a far better position today in comparison to those who stayed in Africa. I also got the feeling that he believed that since he had achieved a certain level in life, there was no need to entertain the thought of reparations for those that had not been as fortunate. In a speech from Dresser, the client who has tasked them with the case, comes a compelling argument for why reparations may be necessary. "Let me ask you something else. You walk down the street here, outside this building, Midtown Manhattan, center of the world in many ways. People coming, going, important people, people with money, people with power. Now how many black people do you see... How many black men driving cabs, selling hot dogs, hauling garbage or furniture or what have you? how many black women getting off the night shift, or pushing a stroller with a white woman's child inside? How many do you see? And then step inside this building, how many black men and women do you see in here? How many are wearing suits? How many are giving the orders? How many are emptying the garbage? How many are dishing out the macaroni? Now multiply your little life by forty-one million, and is there a need for some acknowledgement that the deck is stacked? Of course there is. This case, the reparations idea, won't lift those men and women out of their disadvantage, but it will cause the whole rest of the world to take notice, to do some counting on their own. An not just the Caucasians, but you too, boys like you who have achieved success in this world easier than you thought you would. Easier than your parents thought you would. We're talking about a conversation here, not a public whipping. It's just that money is the quickest way to get people's attention. You call in the legacy of slavery and nobody bats an eye. You call it six point two trillion dollars and it's a different story." Regardless of where you stand on reparations, if you even have a stance on it, The House Girl is an interesting read and take on the topic. #BookReview: Freeman - Leonard Pitts, Jr.